My mind was blown for a moment. So, I went digging, and my wonder, my joy, my elation was put in its proper place. My guess is that the average newspaper reader, consuming information at a modern-day rate, simply cannot retain yesterday's news, and so there is just no room for the irony of these slick headlines when they are all lined up like this. 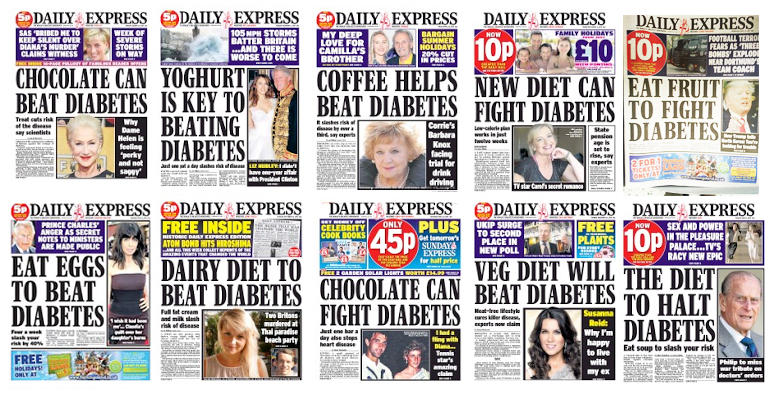 The irony being that a nation of chocolate-munching, coffee-drinking, yoghurt-slurping, egg-frying, and dairy-consuming humans can consider any of those things a cure. Come on guys, if there is a relationship between diabetes and any of these edibles, then statistic would suggest that they are more likely to be the source of the problem, rather than any kind of cure. Diabetes is such a first-world epidemic. And as indicators of a nation's 'development' increase, so to do its incidents of diseases such as this. In fact, many of the foods above are a part of the calculation to determine just how 'developed' a nation is ! So, let's consider that these conditions are almost unheard of in nations where these highly processed foods are not the norm. And as a population eats more of them, the incidents of diabetes increases - so how can they be a cure for it ! While we are famed for our rhetoric on natural food & relaxed exercise, among our top health tips is actually a list of things to drop from your wider daily diet. Of course, refined sugar in all its forms is one of them. Along with grains, beans, alcohol and standard cow dairy, and deeply processed foods generally. But this comes along with a longer list of non-food items, that we often exposure ourselves to daily. A bombarding, negative, or stressful workplace. Any toxic relationship, friendship or family situation that generates stress. What we chose to watch and listen to, is next. I can't even advocate wrapping your chips in them !